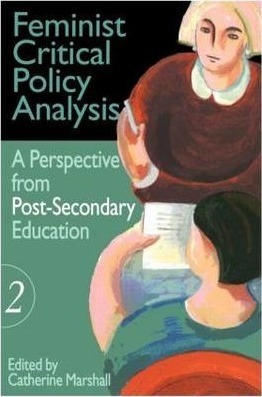 This text sets out to challenge the traditional power basis of the policy decision makers in education. It contests that others who have an equal right to be consulted and have their opinions known have been silenced, declared irrelevant, postponed and otherwise ignored. Policies have thus been formed and implemented without even a cursory feminist critical glance. The chapters in this text illustrate how to incorporate critical and feminist lenses and thus create policies to meet the lived realities, the needs, aspirations and values of women and girls. A particular focus is the primary and secondary sectors of education. Part 1: women managing for diversity in a postmodern world, R. Deem and J. Ozga; making the "People's University" in South Africa, M. Walker; affirmative action and the status of women in the academy, J. Glazer; legitimacy maintenance - the politics of women's studies, C. Marshall and J. O'Barr. Part 2: lesbian existance and the challenge to normative Constructions Of The Academy, E. Bensimon; Emotional Work In A Chilly climate, S. Acker and G. Feuerverger; new piece on women in math in universities, S. Frances. Part 3: "Mother's School" with feminist philosophy in Netherlands, Ter Dam; feminist pedagogy and the politics of authority, power and desire - educational theory, C. Luke; teaching to trangress - education as the practice of freedom, B. Hooks; from margin to marginality - a feminist in a PE classroom, R. Lock.